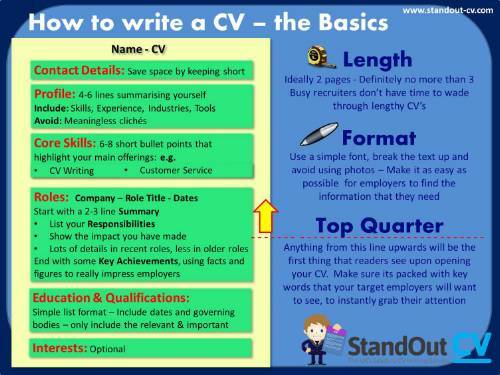 Structure is extremely important when preparing your CV. Recruiters and hiring managers tend to be very busy people; therefore you need to make it as easy as possible for them to read your CV so they can quickly find the information that is relevant to their vacancies. Use similar sections and headings to those in the infographic above and make sure that everything is clearly laid out using a simple font. Break information up so that it is easily digestible and use bullet points in your role descriptions - Avoid big chunks of text and keep the CV between two and three pages in length. A short and sharp profile at the top of your CV can really grab a recruiter's attention when done properly. Ideally your profile should be around 3-6 lines, giving a high level overview of your skills, experience and knowledge whilst demonstrating how they can benefit a potential employer. Keep it factual, avoid cliché phrases and really sell yourself. This is the first thing a recruiter or employer will see so it needs to be packed with the skills and experience that they will be looking for. * Environments you work in: e.g. busy sales floor, high profile government building etc. If you really want to make an impression on recruiters then be sure to back your claims up with some impressive numbers. Be sure to triple check your CV for grammatical errors before sending it to anybody and ensure that the tone is as professional as you can make it - it only takes one mistake for a recruiter to start doubting your credibility. When writing your CV, the most important thing to remember is that you must show the reader that you are suitable for their job vacancy if you want an interview - so ensure that you highlight the skills and knowledge that recruiters are typically asking for in the job adverts that you are responding to.